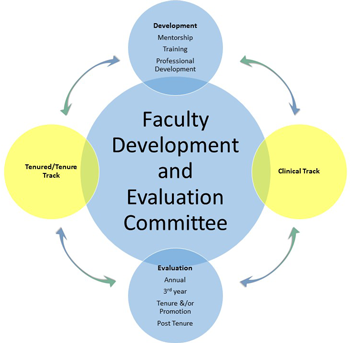 Conduct periodic post-tenure evaluations in conjunction with the office of the Dean. The FDEC members will be made up of a minimum of one representative from each CHS program/department to serve on this committee. Members may be of any academic rank, however, there will be representation from both tenured/tenure track and clinical track faculty members. The FDEC will be co-chaired by one tenured faculty member and one clinical track faculty member. The appointment of all committee members will be for 2 years with the possibility of re-appointment. When needed, guests will be invited to discuss specific initiatives. Create the monthly meeting agendas and send to all members. Take minutes and distribute to committee members.